Traditional Cast Iron Stove styling. DEFRA approved for burning wood in smoke control areas. Up to 3 times cleaner burn than current standards require. Quality solid 5mm cast iron construction for durability and heat retention. New door lock mechanism. Ensures airtight seal. DEFRA approved for burning wood in smoke control areas. Up to 3 times cleaner burn than current standards require. If you’re looking for a stove that’s kind to the environment – as well as being kind to you – it has to be a Consort. The Consort 7, like other models in the range, has timeless appeal. But beneath those old-style looks lies a truly modern stove. The days of smoke-puffing chimneys and sooty windows are past: with the Consort 7, you can enjoy a good old wood fire without the harmful emissions or the elbow grease. To reduce emissions, an air jet ignites the gases which are released during combustion, so they burn away cleanly. 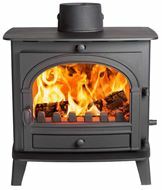 A recouper inside the stove directs the heat given off by the fuel, so it stays inside the stove for longer, being directed outwards rather than upwards, an internal ‘airwash’ then creates jets of air between the fire and the glass door, so that carbon deposits can’t reach the glass. Your stove stays cleaner, the environment stays healthier, and your home stays warmer – and that’s all you could ask from a stove.